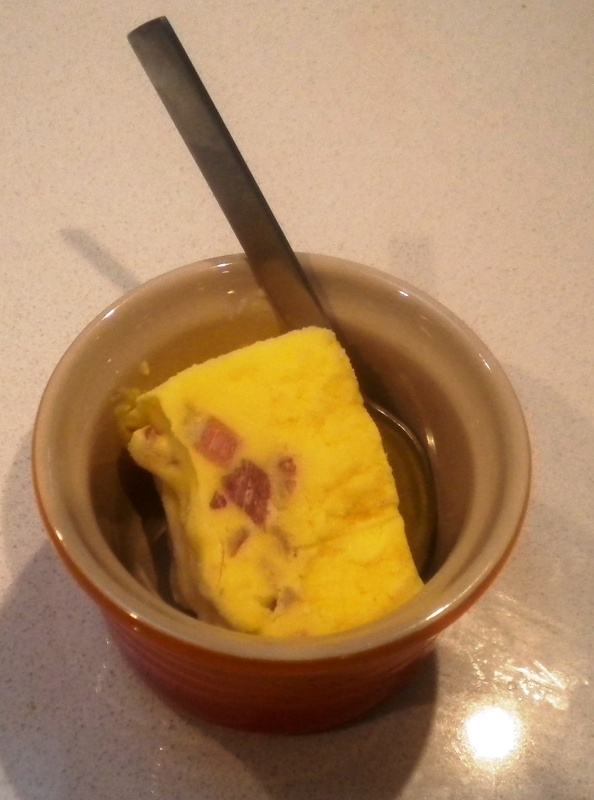 Lo-Carb Maple bacon ice cream is a variation on the Easy Lo-Carb Ice Cream recipe that infuses the flavour of Hickory Smoke and Bacon into the Ice Cream AND also kicks the egg flavour up a notch by slightly over cooking the eggs when making the custard. 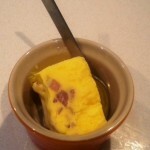 The end result is a dessert that if you close your eyes, you will think that you just had a mouthful of breakfast Bacon and Eggs – yet it is cold like Ice Cream and of course because its made from pure cream it’s incredibly rich, so we’re going to need those stupidly small mini-spoons again. 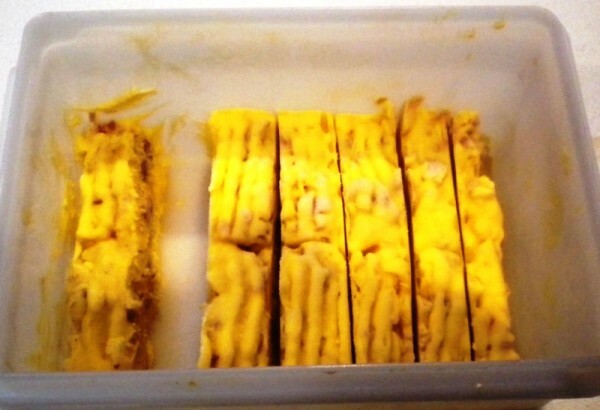 Yes it is true you can have Diet food that is mostly Fat, because it is good healthy animal fats. If your cream and Bacon was sourced from animals that lived on grass for most of their lives it will be relatively higher in Omega 3 unsaturated fatty acids (3:1 ratio) than grain fed animals which store mainly Omega 6 unsaturated fatty acids (20:1 ratio). Because Fats are so energy dense, you need much less volume to feel satisfied. Finally almost all the carbohydrates in this meal are the residual milk sugars (lactose) remaining in the cream and the trace amounts of glucose in the egg – so while it tastes sweet it won’t trouble your insulin. 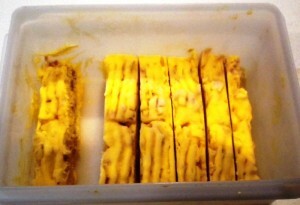 This dish looks like a Dessert, but it has the flavour of Breakfast. 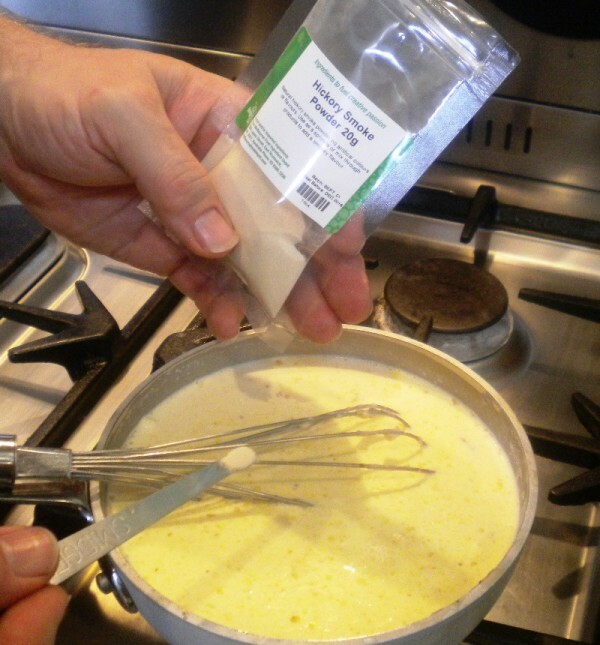 5 Drops Concentrated Maple Essence Not the syrup which is full of sugar, this is just the maple flavour. 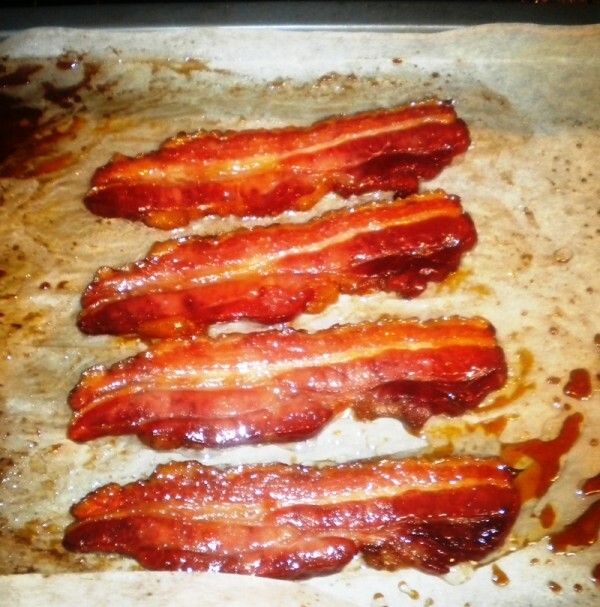 Sprinkle 2 tablespoons of sweetener on the bacon and bake them at 200C for 20mins or until crispy. Make sure to turn regularly. Let cool and then chop well with a cleaver. 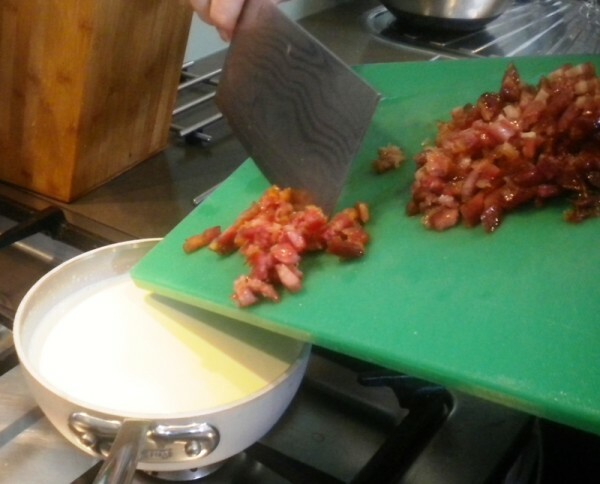 Add the bacon to the cream in a saucepan and simmer, stirring gently until bubbles start to appear at the edge of the pan. If you taste the cream it should be quite bacony now. Add maple essence to taste - I like just a hint so I only gave it 5 drops but you should adjust the flavour for yourself. 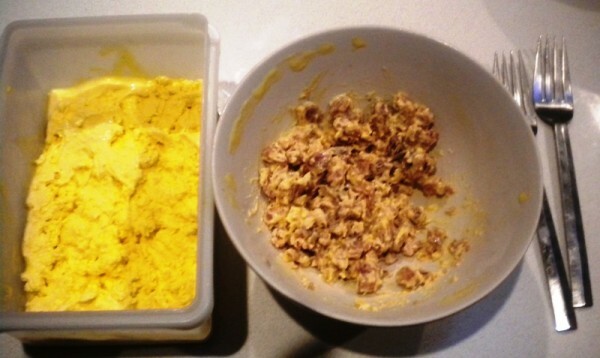 Remember it won't be sweet yet until you mix it with the eggs. Add enough Hickory Smoke powder to compliment the Bacon. This spoon I use is part of Julies cheese making kit and it's actually an official unit called a smidgen which is 1/32nd of a teaspoon. It won't need much. Whisk egg yolks and Splenda in a glass bowl, then cook over a pot of boiling water and keep whisking until the egg turns almost white. 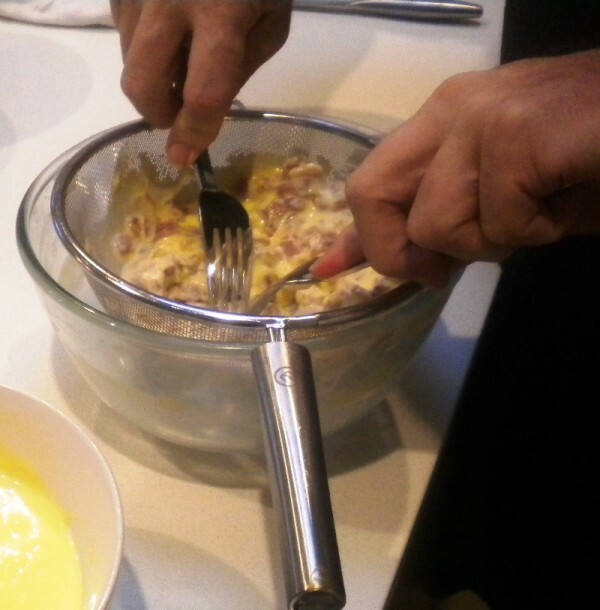 You can afford to overcook the egg slightly as that will just increase the egg flavour but don't let the curds get solid and lumpy or you will have to work hard on the whisk when adding the cream in to get rid of the lumps. 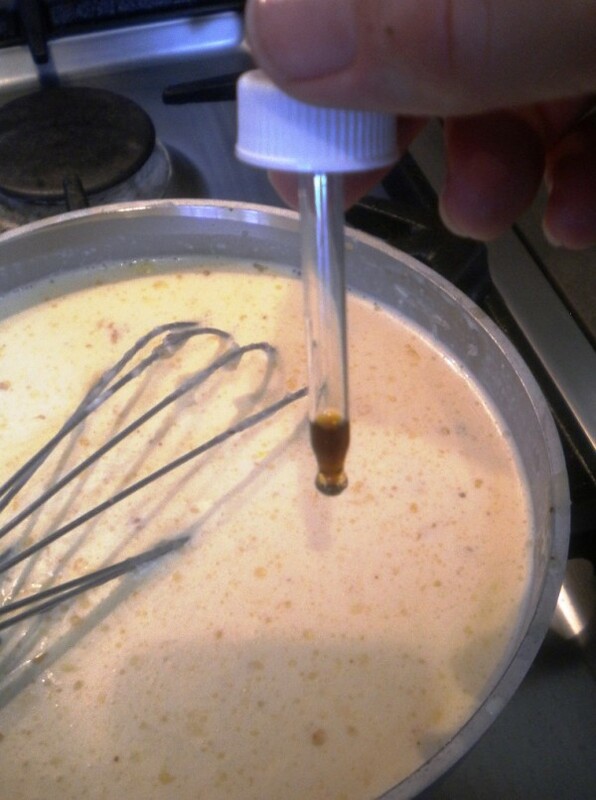 Add a ladle of the heated cream to the eggs and blend well with a whisk. 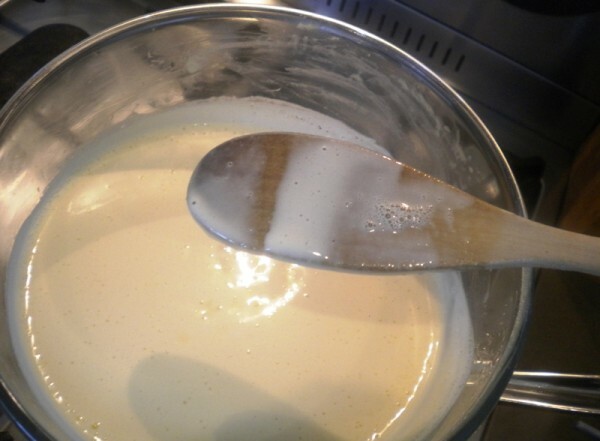 Then add the remaining cream. 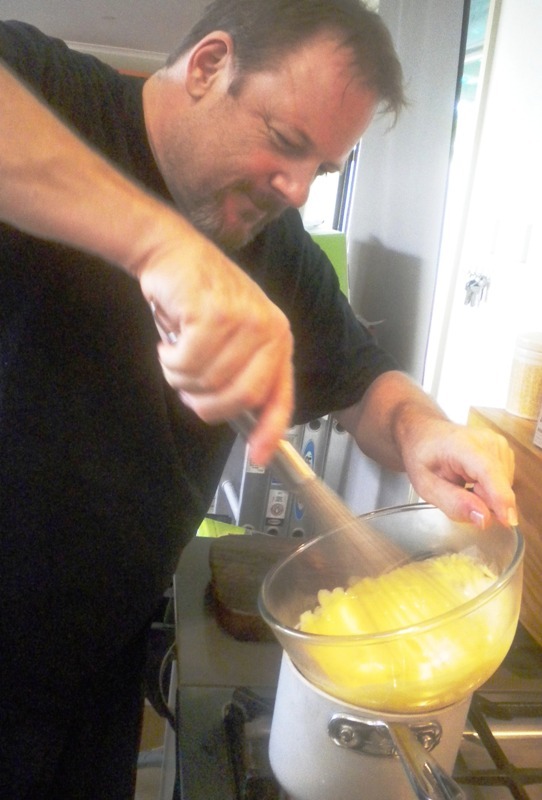 Taste the final mixture and add smoked salt to taste and then adjust for sweetness. 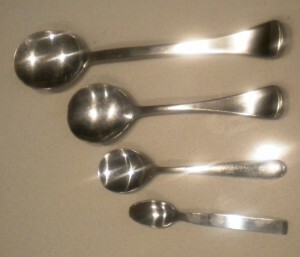 Return the bowl to the boiling pot and keep stirring until the custard has thickened and coats the back of the spoon. Chill the mixture using the ice bath as per the Easy Lo-Carb Ice Cream, and leave the Bacon bits in the mix over night in the fridge to extract as much flavour as possible. Before adding the custard to the Ice Cream maker strain it using a kitchen sieve to separate out the solid bits of bacon. 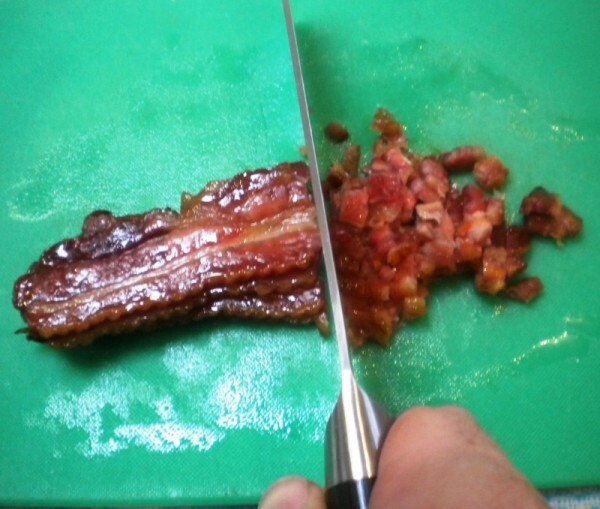 We'll shred the bacon with some forks and put them in the freezer to add them back later on in as a swirl. 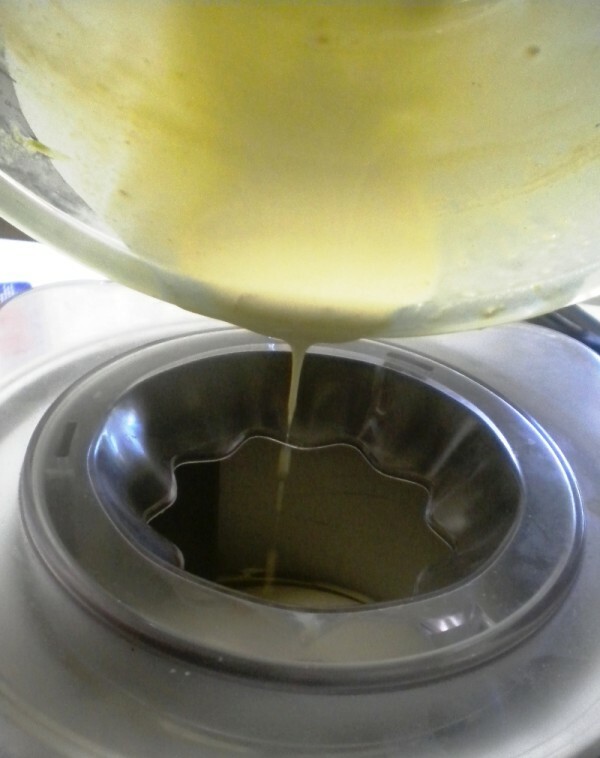 Add the custard to the ice cream maker and follow the rest of the Easy Lo-Carb Ice Cream recipe. Once the freezing container has been filled with frozen Ice Cream, add the shredded bacon and use a spoon to swirl it through the mixture.